Finally!!! 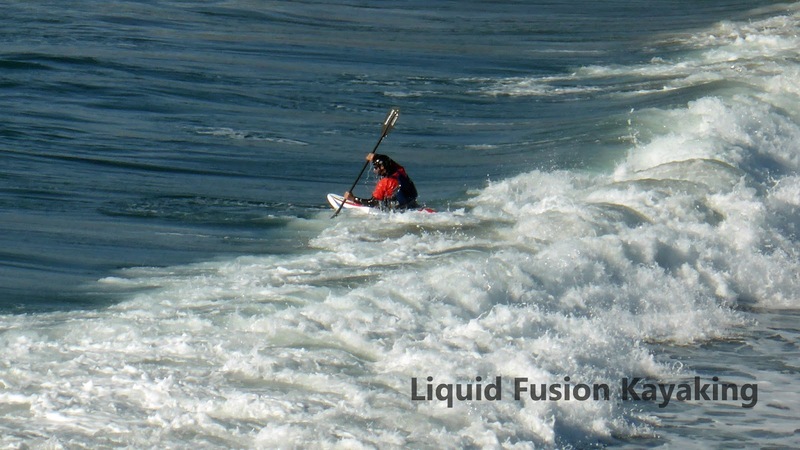 Winter Whitewater season has arrived!!! 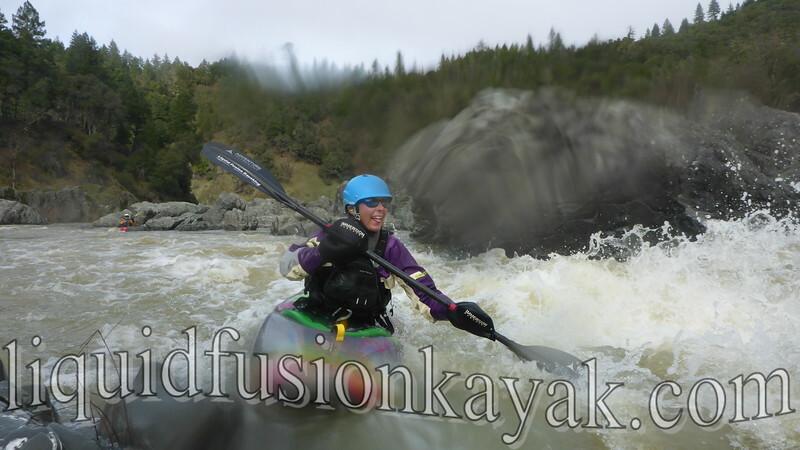 Whitewater Kayaking on Mendocino's Eel River! 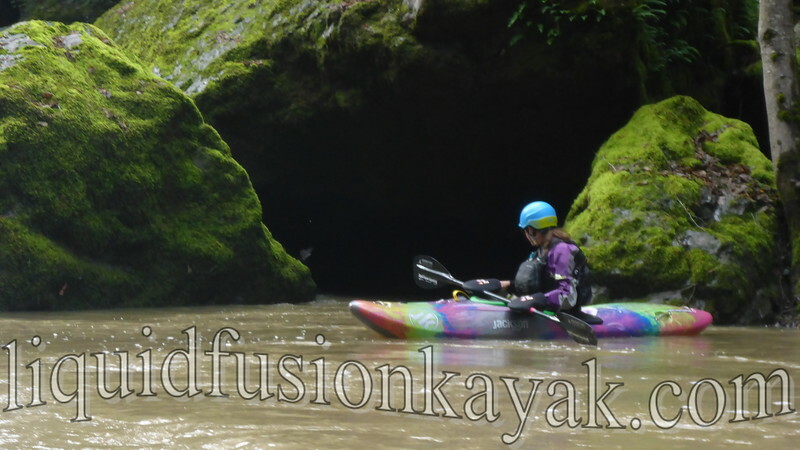 This week's river runs reminded me what I love about river kayaking - the amazing scenery, intriguing geology, and technical paddling. 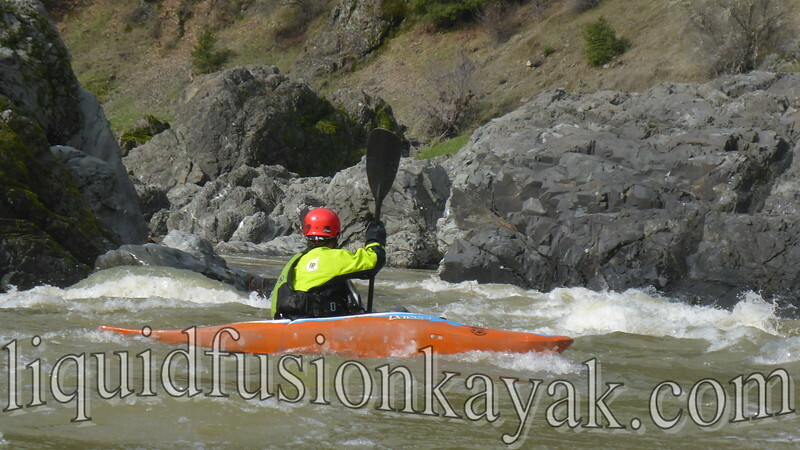 I encourage everyone to get out on a river sometime - boat, raft, canoe, kayak, inner tube, or maybe even SUP. The perspective of a river canyon from the water is amazing. On slow stretches, it is ideal for contemplation as one goes along with the flow. I marvel over the geology. I often day dream about what the river might have looked like 10,000, 100,000 or a million years ago. Logs way up on the rocks are remnants of floods. 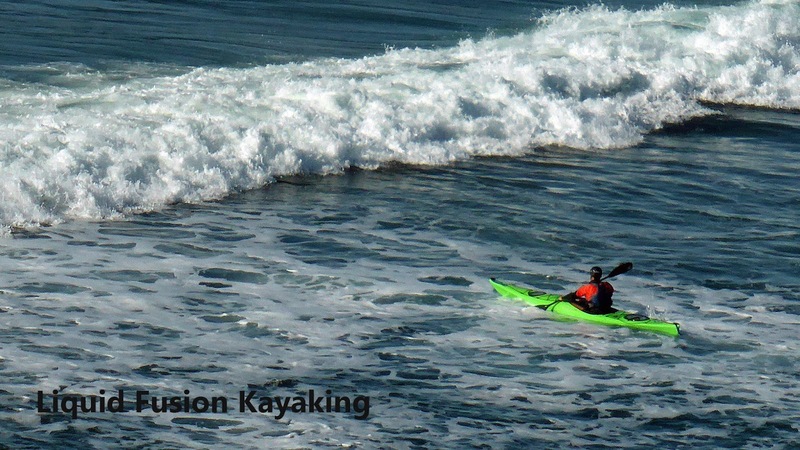 I like the technical aspects of kayaking rivers and feel that river running has enhanced my sea kayaking skills. 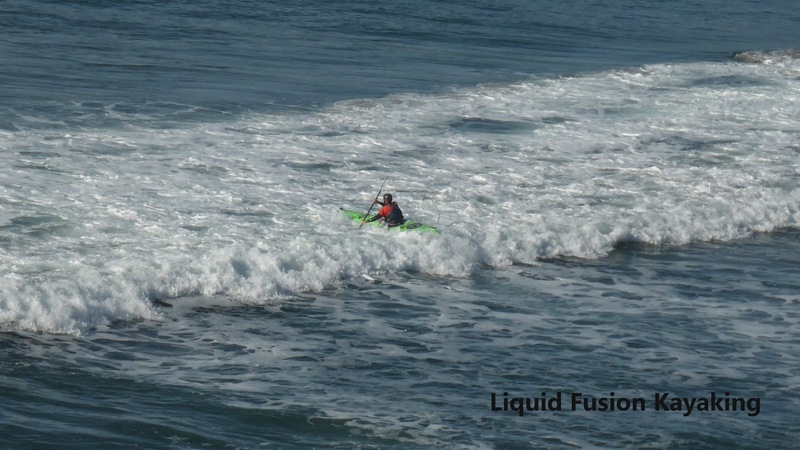 It is fun to play with the currents and hydraulic features. Zipping in and out of eddies, ferrying across the river, and surfing river waves are a few of my favorite ways to play on the river. Jeff and I often play a game of tic-tac-toe on rapids - seeing how many times we can cross a rapid or how many eddies we can catch. Honing in our river running skills with a little Tic-Tac-Toe. 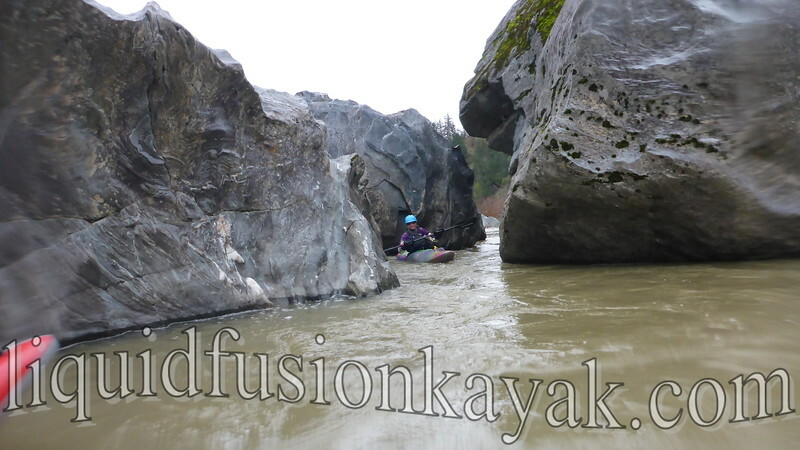 My ideal river trip comprises a combination of scenery and technical paddling. 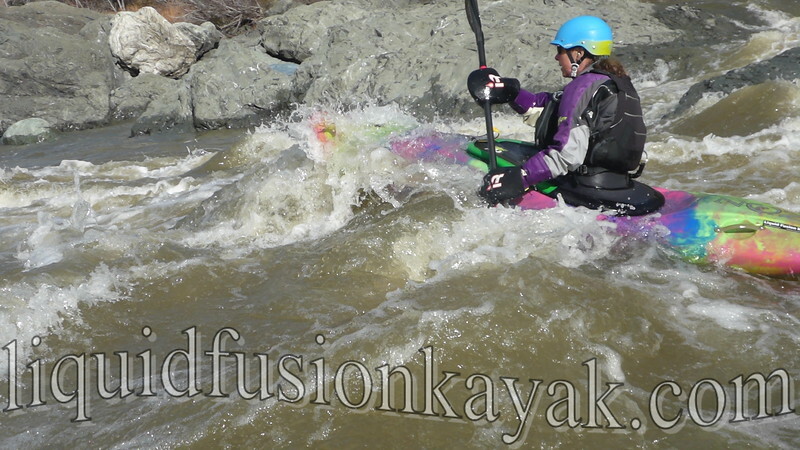 I especially enjoy whitewater overnight runs and am dreaming up ideas for our 2018 Spring Run Off Trip. In Mendocino County, we need rain to get our rivers flowing. We have been getting regular rain and now our rivers are primed and flowing. This week, I got to run 3 of my favorite local runs and am super jazzed that whitewater river season is here. 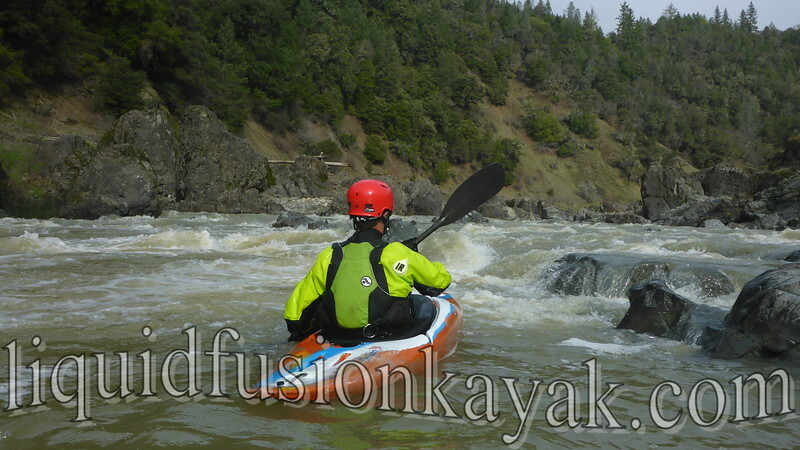 The Outlet Creek Run on the main fork of the Eel River is a fun 7 mile Class III stretch and the stretch that we kayak the most. Here is a post that I wrote describing it - Eel Below Outlet Creek. 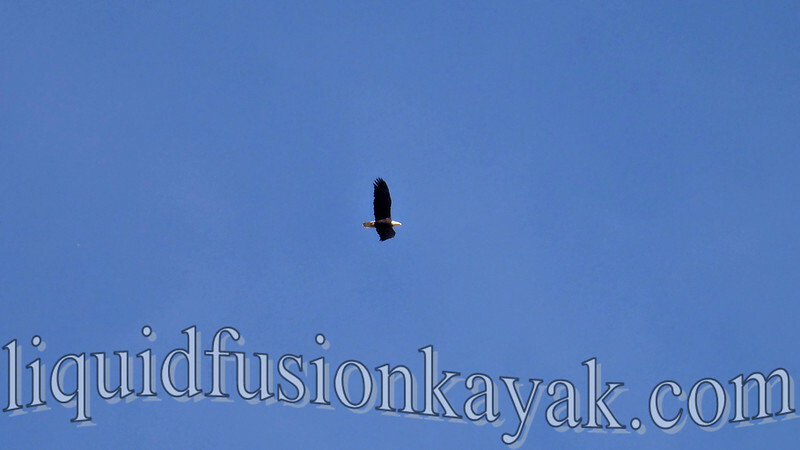 Bald Eagle soaring over the Eel River. 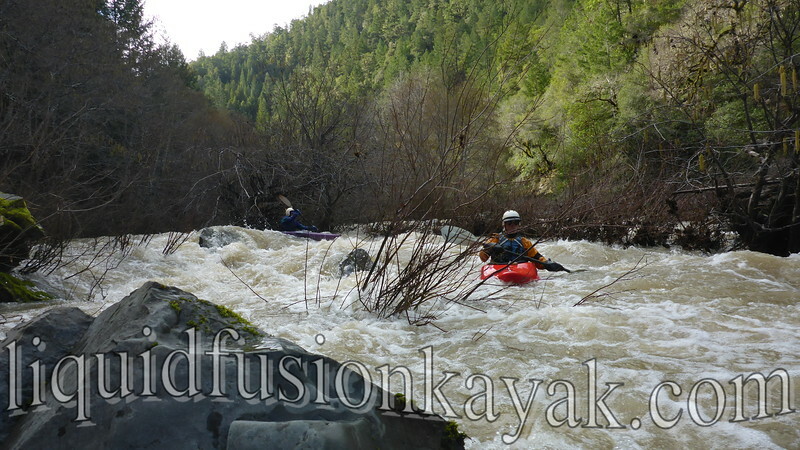 Imagine kayaking on a creek through the redwood forest. It is beautiful, and I never feel like photos do it justice. A river otter spies on us from a cave on the creek. The peanut gallery of foul weather friends cheering for Allen on "All Day Wave." 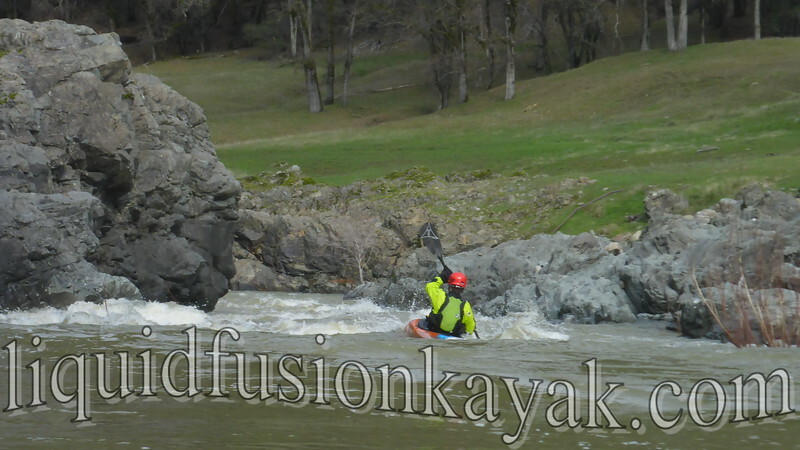 Willows n Rocks keep paddlers on their toes on Rancheria Creek. The Hearst run on the Eel is a 17 mile wilderness run. Watching for bears, pigs, deer, bobcats, and cougars on the hillsides. Meandering through huge boulders and marveling at how the channels were created. It is raining again today!!! 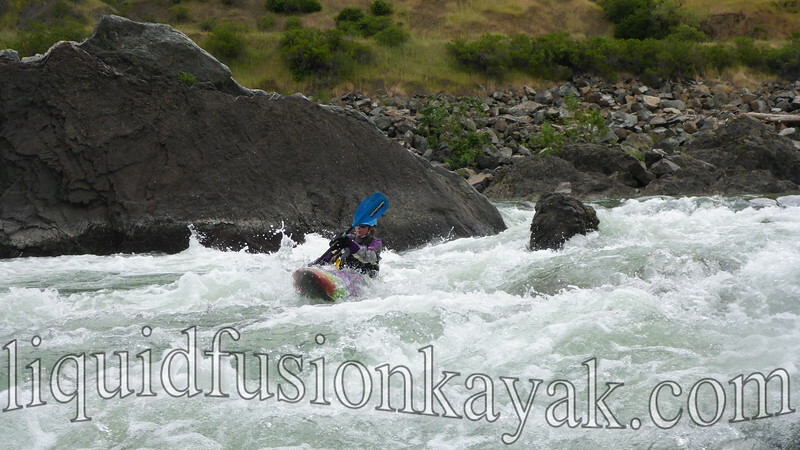 I am looking forward to more whitewater this week!!! 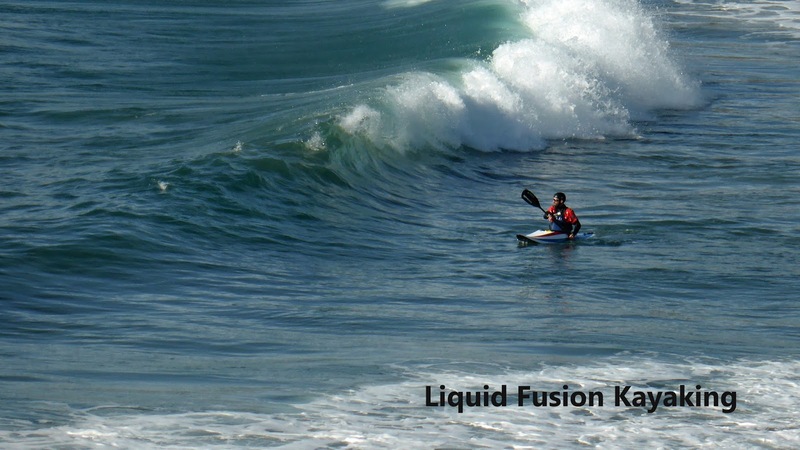 For this post in my surf kayaking series, I have surf guru Jeff Laxier sharing his tips for Paddling Out. Jeff has a lifetime of playing in the surf and is a sea, whitewater, and surf kayak instructor for Liquid Fusion Kayaking. 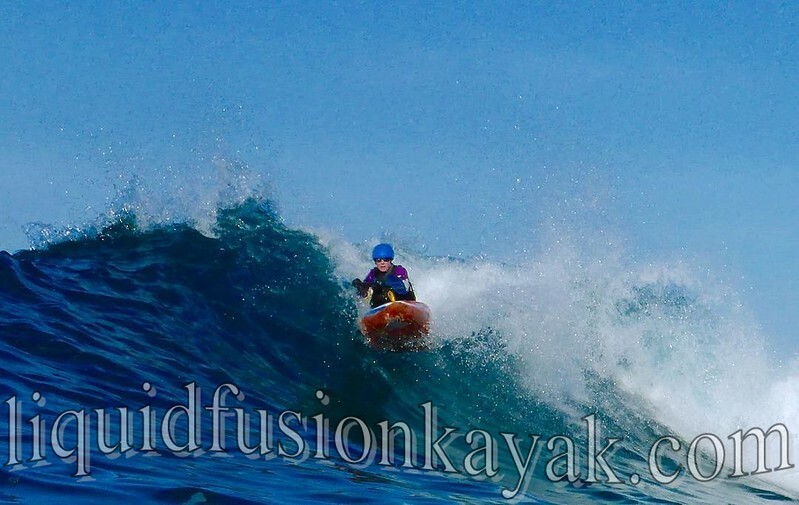 Jeff Laxier surfing on the Oregon Coast. There are many ways to get out to the waves and here we will explore the three methods I use most to paddle out: Bunny Hop, Turtle Dive, Route Finding. All three methods have four of the same components. 1. Speed - We need to be moving to get through a wave. 2. Angle - Boat angle to the incoming wave. 3. 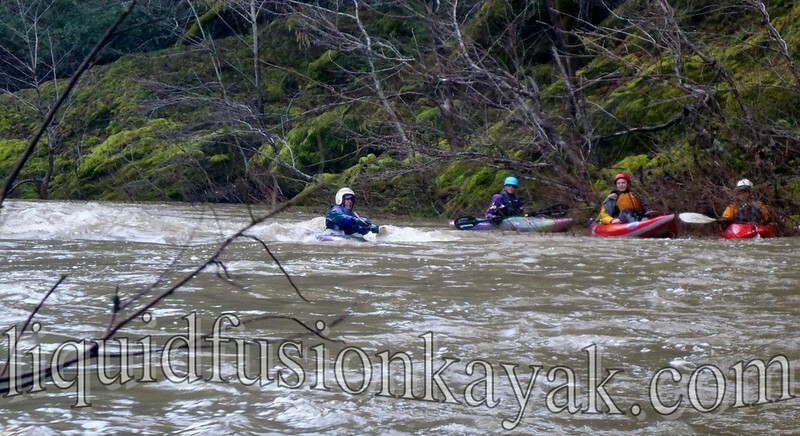 Timing - When to paddle hard, when to hold position, and when to run away. 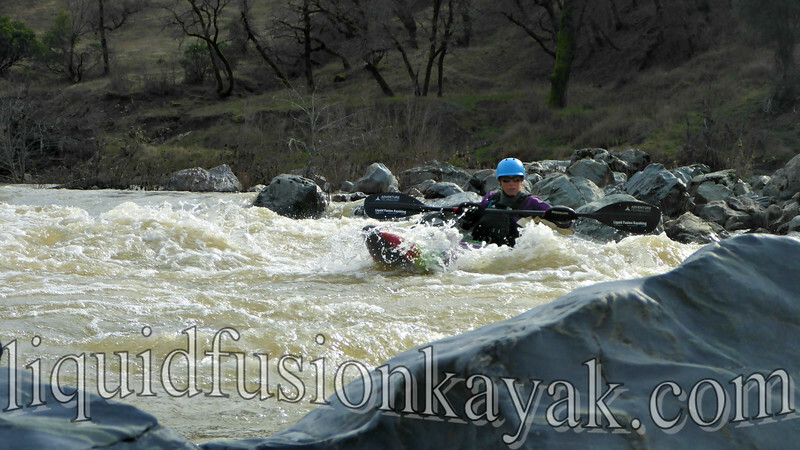 The Bunny Hop: This is a fun way to blast up and over a foam pile (this can also work on river hydraulics). 1. Generate speed with 3-5 strokes as you approach the foam pile. Bunny Hop - Generate Speed. 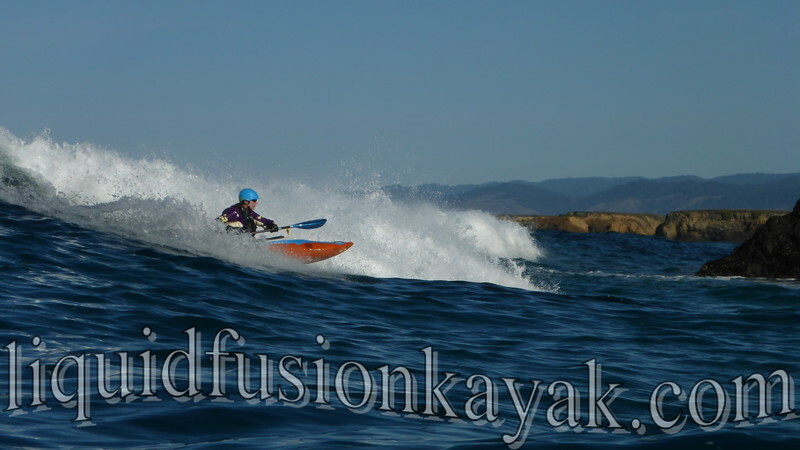 Bunny Hop - Lunge forward and paddle away. The Turtle Dive: This is a great way to avoid a dumping wave on your head, getting hit in the gut by a powerful wave or foam pile, and decreases the likelihood of the wave pushing you back to shore. 2. 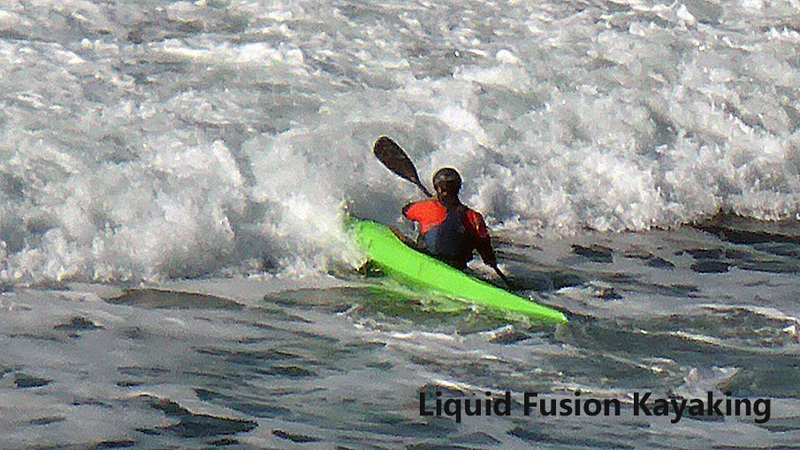 Flip - Capsize with precision so your bow will bury into the seam where white and green water meet then push up with your paddle (this brings the bow deeper). 4. Roll up and GO! 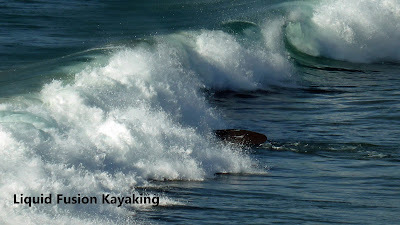 Do not be plankton - Dig in and paddle away! Turtle Dive - Generate speed and capsize so bow buries in the seam. 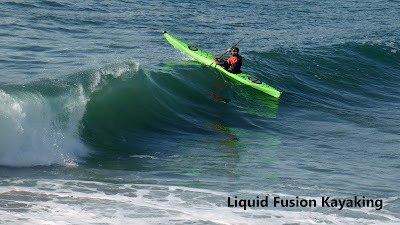 Turtle Dive - Push with paddle to drive bow deeper and wait for wave to pass. Turtle Dive - When wave has passed over you, roll up. Turtle Dive - Dig in and paddle away! Route Finding: Look for an easy path out to the line up with the possibility of a dry hair paddle out. 1. Find a rip that will take you out to the outside. 2. Establish reference points. These will help you make route changes as well and help you avoid the most severe sections. This can also help in reading your progress. 3. Find the soft spots - Smaller or less consistent waves breaking (path of least resistance). 4. Wait for your window of opportunity (wait for a lull). 5. Be patient and aware. Route finding - find a rip and ride it to the outside. 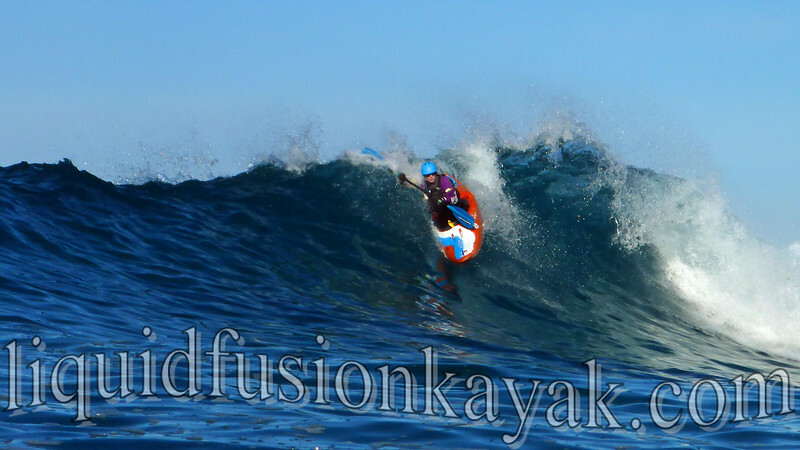 Route finding - find the soft spot of the wave or where it isn't breaking. Surfing waves is great fun, and getting out past the breakers is necessary in all types of craft. Whatever your craft (surf kayak, whitewater kayak, sea kayak, surfboard, stand up paddleboard), we have to paddle out. 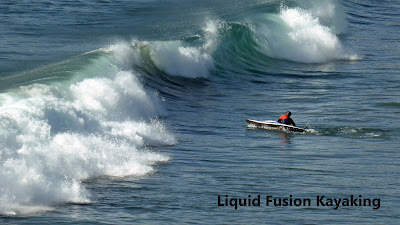 A seasoned paddler will make this journey out to the lineup easy, effective and efficient and have more energy for surfing. We must plan and prepare both mentally and physically. 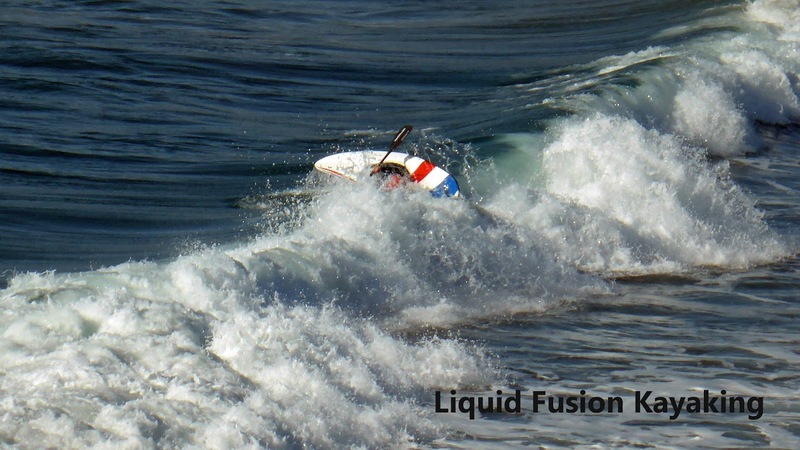 The more challenging the paddle out the more physical and mental toughness is needed. We were guiding day 3 of Liquid Fusion Kayaking's Whitewater n Surf Safari. 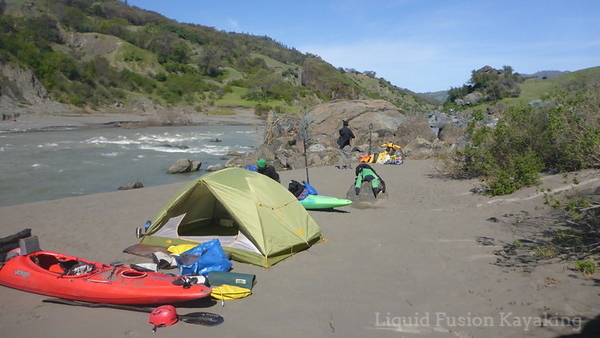 The goal of this 3 day trip is maximum fun in whitewater kayaks and obtaining the Mendocino Whitewater Trifecta - whitewater river running, rock gardening, and surf kayaking. 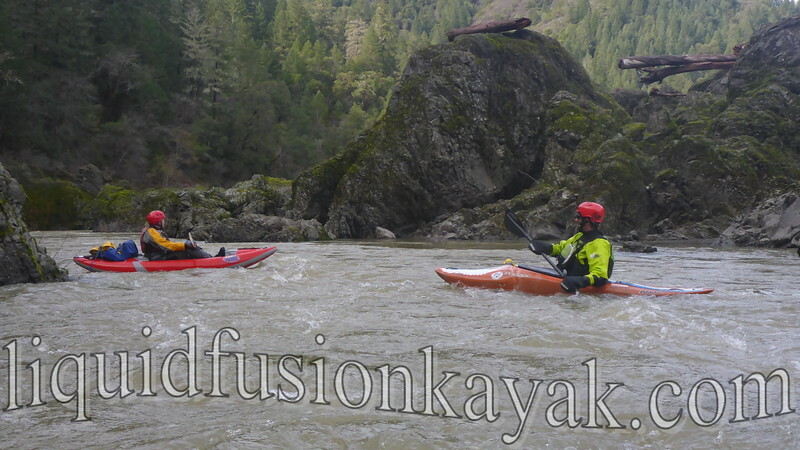 Unfortunately we had a beautiful warm and sunny December which meant no water for a whitewater run on the Eel River. As usual, we make do with what mother nature give us and we had 2 days of really fun rock gardening. Now on day 3 it was time to find some surf. 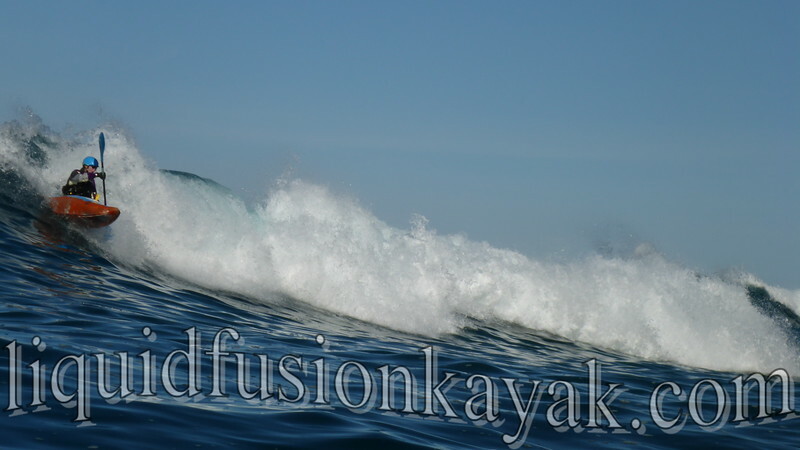 The swell forecast was very small and our students were skeptical if we would find any waves. We found some. Thanks Jeff for capturing the shots and sharing the stoke! We are going to rock n surf in 2018!